Blowout Sale! 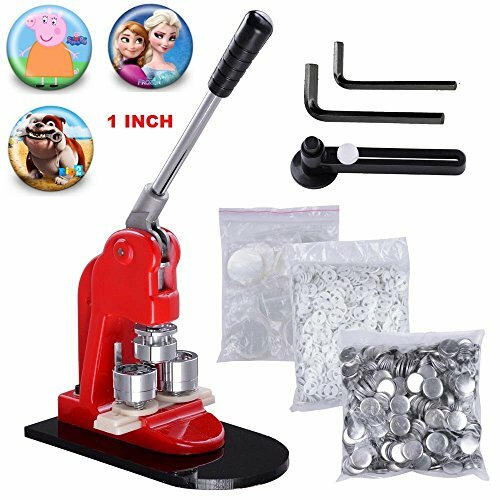 Save 53% on the Superland Button Maker 1Inch 25mm Button Maker Machine 1000Pcs Button Parts Button Badge Maker and Circle Cutter for School DIY (1000pcs) by Superland at Vains Faktory. MPN: Button Maker. Hurry! Limited time offer. Offer valid only while supplies last. 1Inch 25mm Button Maker Machine 500Pcs Button Parts Button Badge Maker and Circle Cutter The badges are the most popular ornaments in the world. The badges are the most popular ornaments in the world. They are young people's favorite. With this badge making machine, you can transfer your personal pictures into the popular badges, making personalized badges which is an amazingly unique and fashionable ornament and gift. (1) Print out the pictures on normal paper. (2) Cut the picture to proper size by circle cutter (plastic cutter or metal cutter), the size of picture should be the same as transparent film. (1) Set the bottom mould on the machine. (2) Set the top mould. (1) Put the badge metal cover into the top cover mould. (2) Put the picture on the cover. (3) Then put the transparent film on the picture, press the badge making machine. (4) Add pin on the bottom cover and put it into cover mould. (5) Move back the mould base to the cover mould, press the badge making machine. 1000 X 1" Complete Button Parts to make 500 buttons. If you have any questions about this product by Superland, contact us by completing and submitting the form below. If you are looking for a specif part number, please include it with your message.